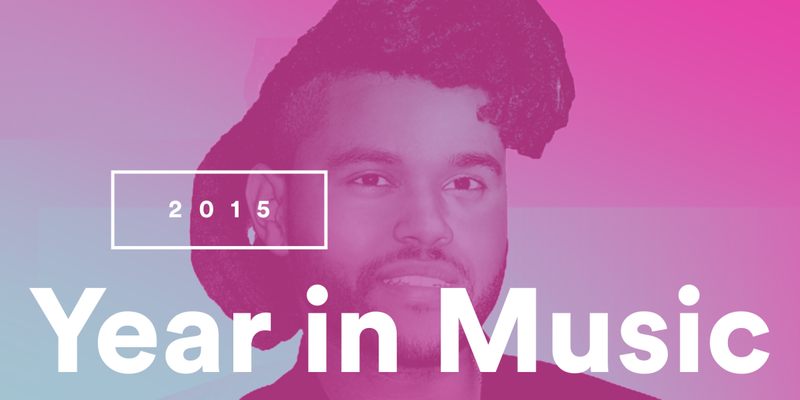 Every year Spotify releases its ‘Year in Music‘ personalized site of how your year of listening unfolded and this year’s is finally here. 2015’s version is better than ever and offers a great deep dive into your most listened albums, artists and tracks as well as statistics about your overall listening. You’ll need to log in with your Spotify account to get the goods and it’ll tell you how much more you listened to this year versus last. I was surprised to learn I listened to over 21,000 minutes of music this year across 1,445 artists. Right at the end you’ll see overall service statistics, such as top artist (Drake), top albums (The Weeknd) and top song (Lean On by Major Lazer). Spotify says it played more than 28.5 million tracks during 2015, an increase of 3 million over last year. There’s a fun little easter egg hidden on the site, too, if you load it and then type anything on the end of the URL in the address bar to break it — you’ll get a 404 page with Justin Bieber’s ‘Sorry’ playing in the background. The Year in Music app is a reminder of just how awesome Spotify is — these little summaries are a great way to get insights into how your habits and tastes change each year, as well as just how much music you consumed.